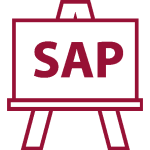 SAP EWM110 – Extended Warehouse Management Customizing - ITICA s.r.o. Configure and create the required EWM organizational elements and master data Configure the use of Storage Types, Storage Sections and Activity Areas for various EWM processes Set up process and layout oriented storage control for goods receipt and good issue Create the necessary EWM settings to perform replenishment. Understand the use and processes related to posting changes in EWM. Describe, configure and execute physical inventory processing in EWM. Create the required settings and data in the EWM system to perform slotting and rearrangement.